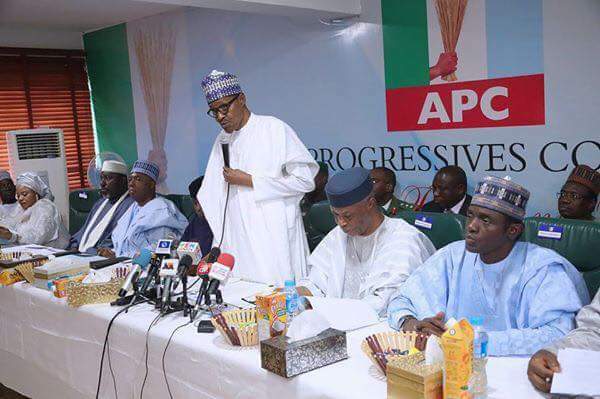 United Kingdom (UK) chapter of the All Progressives Congress (APC) has said it would pay for Expression of Interest and Nomination form for President Muhammadu Buhari to re-contest in 2019. The chapter made the promise in a statement by its spokesman, Mr Jacob Ogunseye, on Tuesday in Abuja, following Buhari’s declaration on Monday that he would seek a second term. It said that the president’s declaration was reasonable and satisfactory, adding that his second term would make Nigeria stronger as well as preserve the tenets of democracy in the country. It stated that the chapter`s expectations had been met by Buhari`s declaration, and assured that it would work assiduously for the electoral success of the APC at all levels. “President Buhari needs to consolidate on the achievements his administration has recorded in over three years, especially in economic growth, anti-graft war, security and youth development. “He deserves a second term and we are proud that he has yielded and declared his readiness to re-contest the election as Nigeria’s President in 2019 in earnest. “His administration’s achievements in the areas of security, economic growth, anti-corruption war and social development and other areas are visible to Nigerians,’’ the chapter said. It added that Nigerians should consider the re-election bid as a major step to consolidate and re-invent the country into an emerging economic and democratic world power. It called on Nigerians across the world, irrespective of religion and geographical location, to see the re-election bid of the president as a major step that would help Nigeria to stabilise.